After our gym workout and eggnog I threw this together in about 20 minutes. It really only has four ingredients – those in the title. There is a little rapeseed oil and rosemary too. This very quick and easy dinner comes courtesy of Hugh Fearnley Whittingstall (again) and the River Cottage Light and Easy book. I love this book. I’ve yet to find anything challenging or time consuming – and that’s what you want when you don’t get in until 9pm on a Friday night. This is a genius dish and is all done in one pan. Just grab a big pan and fry some sliced parsnips with chopped rosemary until they take on some colour. Then add the chorizo and let the oils and the spice work their way into the veg. 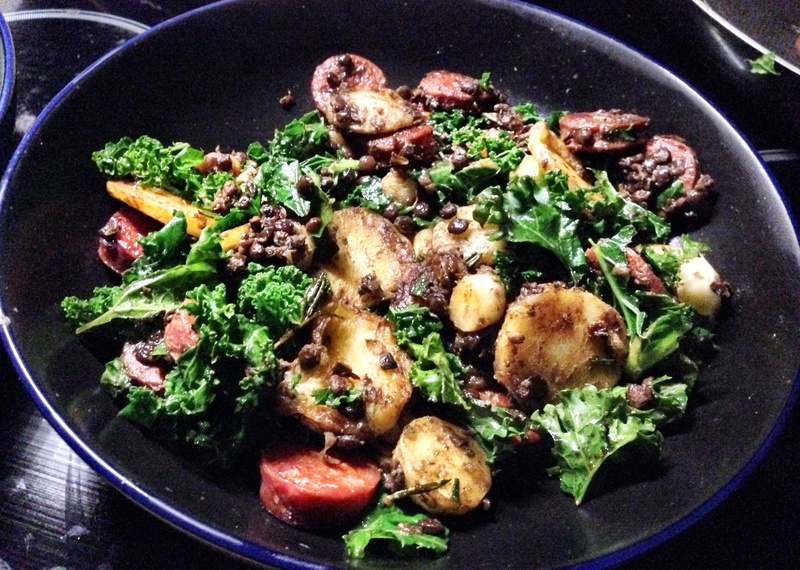 Finally stir in the kale and pre-cooked Puy Lentils and wait for the kale to wilt – all the while stiring the pan. And that’s it. Significantly less time than it took to make eggnog! Took me 10 minutes to beat egg whites! We ate this whilst watching The Maze Runner. Not a very impressive film in my opinion but I think I’ve been spoilt by good films of late. Tonight I think we are going to start with the 4 hour epic Red Cliff! Anyway, this is very tasty and a very filling meal. I loved it. Freya found it a little salty but I think that was my fault with the seasoning. We munched through it in no time. I’ll definitely be making this again – probably very soon given I have all the same ingredients left over and need to use them up!